In their final tutoring session, Blake and Ellie finally become brave enough to take the leap of faith. But, life has other plans and rips them apart. Six years later Blake and his best friends Ben and Billy have built a successful internet platform company 3BCubed, while Ellie is a successful and hardworking lawyer specialising in Corporate Law. 3BCubed is being threatened with a devastatingly large plagiarism case and when it lands on their lawyers desk, it’s handed to the new Corporate Lawyer to handle and win. Binary Law will have Blake and Ellie propelled into a life that’s a whirlwind of catastrophic events and situations where every emotion will be touched. Hurt will be experienced, happiness will be presented and love will be evident. But is that enough for Blake and Ellie be able to live out their own happily ever after? Binary Law was published by M.H. Grace on December 5, 2013. M.H. Grace is made up of two ladies who have bonded and formed a firm friendship over two things. The first (and most importantly) a love of a mutual friend who’s like a sister from other parents to us. And second, the love of books. Both the women have two children each, all four kids are girls and two share the same name and date of birth. Between both women, they have read virtually every genre. When H read M’s first book, she contacted M and since that day they’ve formed a close bond. Talking about books with each other was as easy as talking about husbands, children and life. 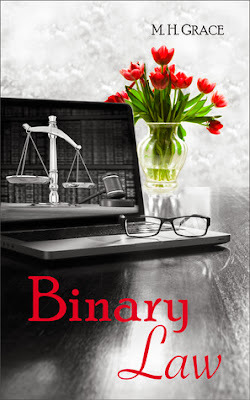 They decided to write a book together and see where the experience took them They wrote Binary Law with no hassles, no issues and definitely no fights. So they decided to make that a series of books and are in the midst of writing Binary Sound which is due out in 2014. They also decided to give the genre Erotica a small little novella, hoping it entices the senses for the readers.